This evening I went to our too-seldom-used front door to turn on the Christmas lights and I discovered a box from Cornell. I wasn't expecting anything so I opened it with eager anticipation...an early Christmas! The box was filled with all kinds of cool stuff from Cornell and Celebrate Urban Birds, and Encyclopedia of Life. "What was it all for? ", I wondered. 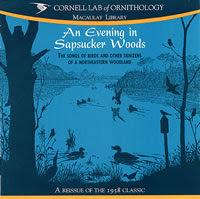 I went to the Celebrate Urban Birds website and it appears that my Spooky Bird poem submission had won a prize...a CD entitled "An Evening in Sapsucker Woods"! How fun is that?! Check out their current challenge here about how birds survive winter!